It may be autumn on the calendar, but it has felt like the height of summer in New York this weekend. Although I wish it felt more like fall, I know that soon I'll be complaining about the cold (not that I don't already do that for the 9-10 hours per day that I spend in an overly air conditioned office). So yesterday, we decided to embrace the heat. We headed to Governor's Island for the first time. We took the 1,2,3 line down to the South Ferry stop, or you could also take the R,W. The Governor's Island ferry station is just a short walk from the subway stop, and runs every 30 minutes on the weekends. It's actually FREE up until 11:30 AM, and only $2 round trip after that. There was a polo match that day on Governor's Island, so the ferry was PACKED with drunk people in fancy clothes and big hats. Lots of good people watching. 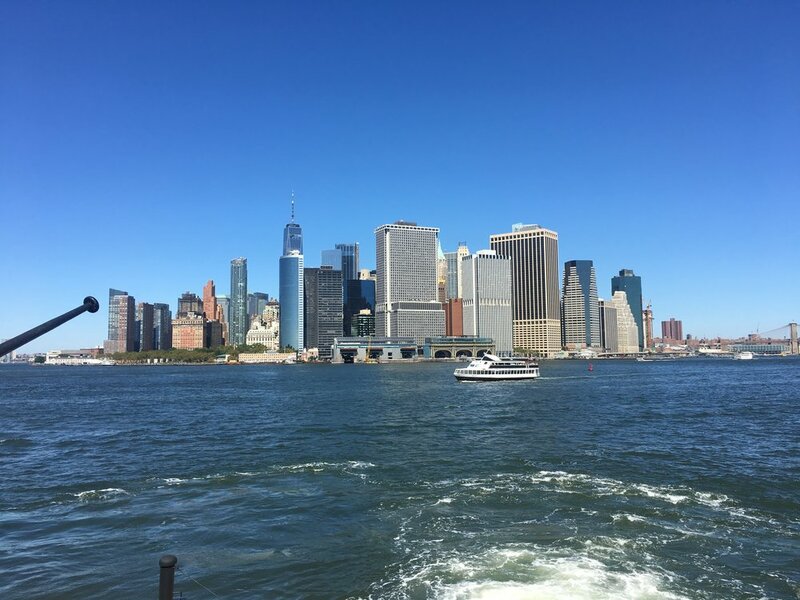 The ferry ride gives you the a spectacular view of lower Manhattan and the harbor. After a 5 minute ride, we set off on the island in search of food. It didn't take long to find the cutest ever oyster bar with a great view, appropriately named Island Oyster. We shared a dozen oysters and the fish tacos. Mmmmm. With a slight cocktail buzz and a belly full of oysters, we set off for a stroll around the island. We found the polo match, and realized that we had never actually seen polo being played in real life before. It was pretty cool to see it going on with the Statue of Liberty and the skyline in the background. We climbed "The Hills", and were rewarded with some of the best views of downtown I've ever seen. 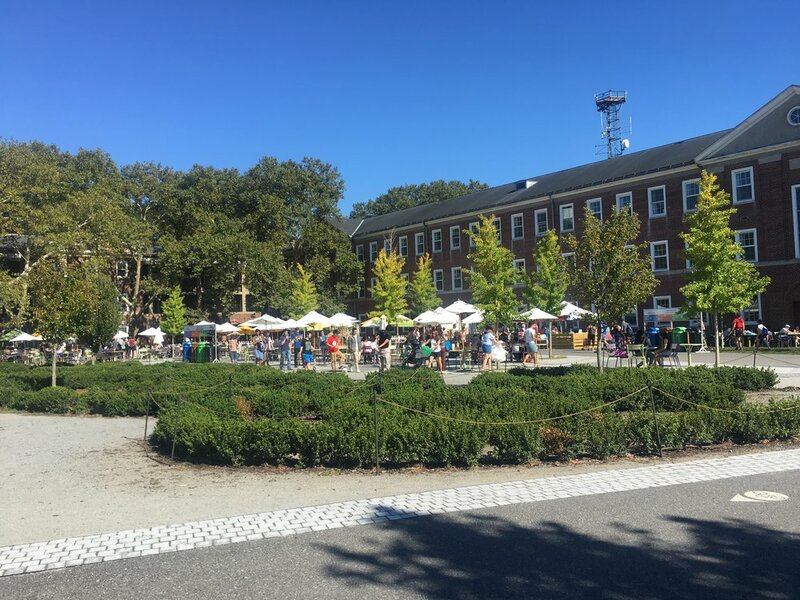 Governor's Island is very progressive, with a cool urban farm and lots of awareness everywhere around recycling and zero-waste. We also discovered a cluster of delicious food stands, a hammock area, and a really nice Picnic Point with a view. By this point it was nearing 88 degrees, and we were losing steam fast, so we hopped on the ferry back to Manhattan. Governor's Island, you're pretty cool, and I'm sorry that I've just now discovered you. I'll definitely be back, next time with a blanket and a picnic packed. (Important Note: they don't let you bring alcohol onto the island. It was sad to see the number of beers and bottles of champagne people had to leave behind before getting on the ferry). Today is going to be another scorcher, so I think we'll find ourselves a nice air-conditioned bar to watch football in. Happy Sunday!